The consequences of the coming bull market in the US dollar, which I’ve been predicting for a number of years, go far beyond suppression of commodity prices (which in general is a good thing for consumers – but could at some point threaten the US shale-oil boom). The all-too-predictable effects of a rising dollar on emerging markets that have been propped up by hot inflows and the dollar carry trade will spread far beyond the emerging markets themselves. This is another key aspect of the not-so-coincidental consequences that we will be exploring in our series on what I feel is a sea change in the global economic environment. I’ve been wrapped up constantly in conferences and symposia the last four days and knew I would want to concentrate on the people and topics I would be exposed to, so I asked my able associate Worth Wray to write this week’s letter on a topic he is very passionate about: the potential train wreck in emerging markets. I’ll have a few comments at the end, but let’s jump right into Worth’s essay. In the autumn of 2009, Kyle Bass told me a scary story that I did not understand until the first “taper tantrum” in May 2013. He said that – in additon to a likely string of sovereign defaults in Europe and an outright currency collapse in Japan – the global debt drama would end with an epic US dollar rally, a dramatic reversal in capital flows, and an absolute bloodbath for emerging markets. Extending that outlook, my friends Mark Hart and Raoul Pal warned that China – seen then by many as the world’s rising power and the most resilient economy in the wake of the global crisis – would face an outright economic collapse, an epic currency crisis, or both. All that seemed almost counterintuitive five years ago when the United States appeared to be the biggest basket case among the major economies and emerging markets seemed far more resilient than their “submerging” advanced-economy peers. But Kyle Bass, Mark Hart, and Raoul Pal are not your typical “macro tourists” who pile into common-knowledge trades and react with the herd. They are exceptionally talented macroeconomic thinkers with an eye for developing trends and the second- and third-order consequences of major policy shifts. On top of their wildly successful bets against the US subprime debacle and the European sovereign debt crisis, it’s now clear that they saw an even bigger macro trend that the whole world (and most of the macro community) missed until very recently: policy divergence. Their shared macro vision looks not only likely, not only probable, but IMMINENT today as the widening gap in economic activity among the United States, Europe, and Japan is beginning to force a dangerous divergence in monetary policy. In a CNBC interview earlier this week from his Barefoot Economic Summit (“Fed Tapers to Zero Next Week”), Kyle Bass explained that this divergence is set to accelerate in the next couple of weeks, as the Fed will likely taper its QE3 purchases to zero. Two days later, Kyle notes, the odds are high that the Bank of Japan will make a Halloween Day announcement that it is expanding its own asset purchases. Such moves only increase the pressure on Mario Draghi and the ECB to pursue “overt QE” of their own. Such a tectonic shift, if it continues, is capable of fueling a 1990s-style US dollar rally with very scary results for emerging markets and dangerous implications for our highly levered, highly integrated global financial system. One “Flight to Safety” Away from an Earth-Shaking Rally? For readers who are unfamiliar with techical analysis, breaking out from a wedge pattern often signals a complete reversal in the trend encompassed within the wedge. As you can see in the chart above, the US Dollar Index has been stuck in a falling wedge pattern for nearly 30 years, with all of its fluctuations contained between a sharply falling upward resistance line and a much flatter lower resistance line. Any break-out beyond the upward resistance shown above is an incredibly bullish sign for the US dollar and an incredibly bearish sign for carry trades around the world that have been funded in US dollars. It’s a clear sign that we may be on the verge of the next wave of the global financial crisis, where financial repression finally backfires and forces all the QE-induced easy money sloshing around the world to come rushing back into safe havens. As John Mauldin described in his recent letter “Sea Change,” the state of the global economy has radically evolved in the wake of the Great Recession. Against the backdrop of extremely accommodative central bank policy in the United States, the United Kingdom, and Japan and the ECB’s “whatever it takes” commitment to keep short-term interest rates low across the Eurozone, global debt-to-GDP has continued its upward explosion in the years since 2008… even as slowing growth and persistent disinflation (both logical side-effects of rising debt) detract from the ability of major economies to service those debts in the future. *Data based on OECD, IMF, and national accounts data. Source: Buttiglione, Lane, Reichlin, & Reinhart. “Deleveraging, What Deleveraging?” 16th Geneva Report on the Global Economy, September 29, 2014. 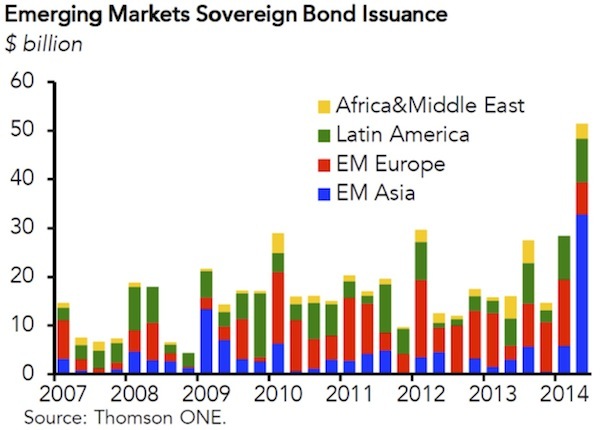 … but the real explosion in debt and financial assets has played out across the emerging markets, where the unwarranted flow of easy money has fueled a borrowing bonanza on top of a massive USD-funded carry trade. 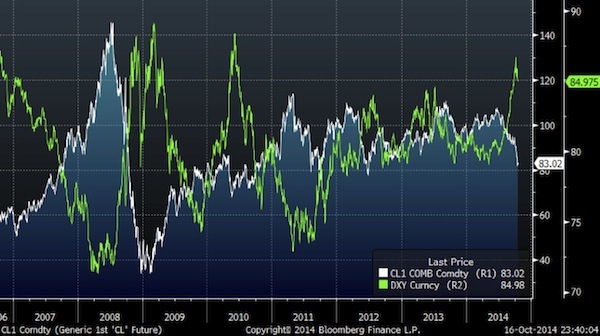 … even as many those markets displayed profound signs of structural weakness. When monetary policy in large countries is extremely and unconventionally accommodative, capital flows into recipient countries tend to increase local leverage; this is not just due to the direct effect of cross-border banking flows but also the indirect effect, as the appreciating exchange rate and rising asset prices, especially of real estate, make it seem that borrowers have more equity than they really have. But the problem goes beyond a logical response to easy money. 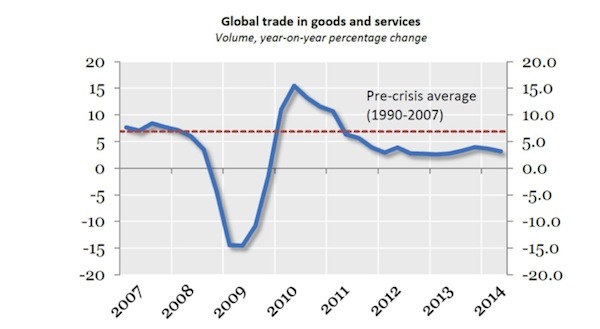 With growth in global trade demand running well below the pre-2008 average, emerging markets face a dangerous dilemma: slow down along with their developed-world customers (which brings on the nasty prospect of social unrest and political regime change) or lever up in an attempt to make the tricky transition to domestically led growth (which may allow incumbent governments to stay in power). Trouble is, as we are seeing in China today, it is exceptionally difficult, if not impossible, in the current weak trade/volatile capital flows environment, to smoothly transition from an export-led growth model to a domestic consumption-driven growth model without a major slowdown along the way. And attempting to make the transition via debt-fueled, state-directed, investment-led growth is likely to result in massive debt bubbles, unmanageable piles of nonperforming loans, and the prospect of a very hard economic landing. John and I have written about this topic several times in the last year (“Central Banker Throwdown” and “Every Central Bank for Itself”), and I believe that understanding the massive flows of capital from developed to emerging markets and the potentially disastrous dynamics behind an abrupt reversal in the emerging-market bubble boom may be the key to comprehending how the final act of the global debt drama will play out. 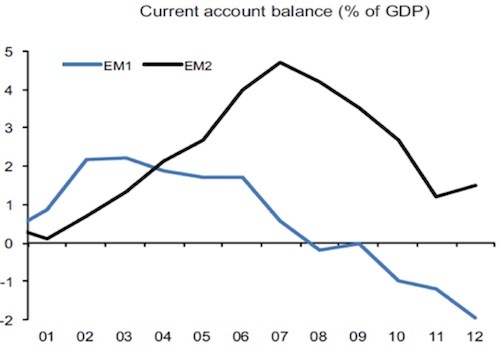 After years of enjoying relatively easy capital inflows and high levels of debt growth against a backdrop of deteriorating fundamentals, the “Fragile Eight” (Argentina, Brazil, Chile, India, Indonesia, Russia, South Africa, and Turkey) find themselves in the “addicted to capital” phase of the balance of payments cycle (outlined in the chart on the next page from Bridgewater Associates), with high vulnerability to a reversal in flows. … and continue to exhibit a dangerous net-negative international investment position, making the Fragile Eight serious candidates for capital flight. Broad-based, debt-fueled overinvestment may appear to kick economic growth into overdrive for a while; but eventually, disappointing returns and consequent selling lead to investment losses, defaults, and banking panics. And in cases where foreign capital seeking strong growth in already highly valued assets drives the investment boom, the miracle often ends with capital flight and currency collapse. Economists call that dynamic – an inflow-induced boom followed by an outflow-induced currency crisis – a “balance of payments cycle,” and it tends to occur in three distinct phases. In the first phase an economic boom attracts foreign capital, which generally flows toward productive uses and reaps attractive returns from an appreciating currency and rising asset prices. In turn, those profits fuel a self-reinforcing cycle of foreign capital inflows, rising asset prices, and a strengthening currency. In the second phase, the allure of continuing high returns morphs into a growth story and attracts ever-stronger capital inflows – even as the boom begins to fade and the strong currency starts to drag on competitiveness. Capital piles into unproductive uses and fuels overinvestment, overconsumption, or both, so that ever more inefficient economic growth depends increasingly on foreign capital inflows. Eventually, the system becomes so unstable that anything from signs of weak earnings growth to an unanticipated rate hike somewhere else in the world can trigger a shift in sentiment and precipitate capital flight. In the third and final phase, capital flight drives a self-reinforcing cycle of falling asset prices, deteriorating fundamentals, and currency depreciation… which in turn invites more even more capital flight. If this stage of the balance of payments cycle is allowed to play out naturally, the currency can fall well below the level required for the economy to regain competitiveness, sparking runaway inflation and wrecking the economy as asset prices crash. In order to avoid that worst-case scenario, central bankers often choose to spend their FX reserves or to substantially raise domestic interest rates to defend their currency. Although it comes at great cost to domestic growth, this kind of intervention often helps to stem the outflows… but it cannot correct the core imbalances. The same destructive cycle of capital flight, falling asset prices, falling growth, and currency depreciation can restart without warning and trigger – even years after a close call – an outright currency collapse if the central bank runs out of policy tools. 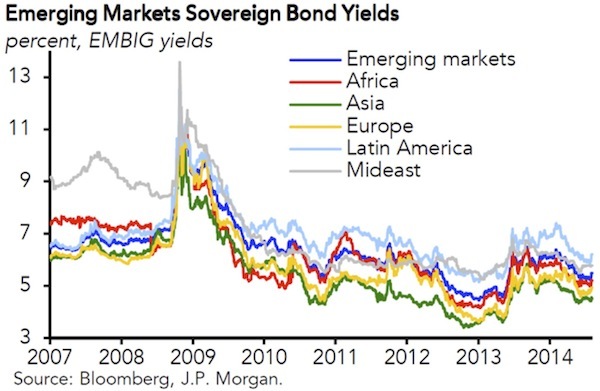 John and I believe that this worst case is the looming risk for many emerging markets today, particularly in the externally leveraged “Fragile Eight” (Argentina, Brazil, Chile, India, Indonesia, Russia, South Africa, and Turkey) and, in the event of a forceful unwind in the USD carry trade, maybe even China. Not only have those countries amassed a disproportionate share of total inflows to emerging markets, but each also has its own insidious combination of structural and political obstacles to long-term growth. Each of these countries is not without options, but the longer they delay in being proactive, the greater the risk. The question for 2014 is, what happens when the tide of easy dollars reverses and reveals a more challenging funding environment? With John’s blessing, I hope to profile each of the fragile emerging markets individually in the coming months and in our upcoming book (working title: Sea Change); but for now I have to limit our discussion to a couple of charts from a recent letter titled “Carry Trade Junkies,” by my good friend Josh Ayers at Paradarch Advisors, along with a few specific observations on three of the most fragile economies. According to official data reported by the Bank for International Settlements and the IMF, Turkey, South Africa, and Chile look like obvious candidates for capital flight and are three of the leading currency-crisis candidates. 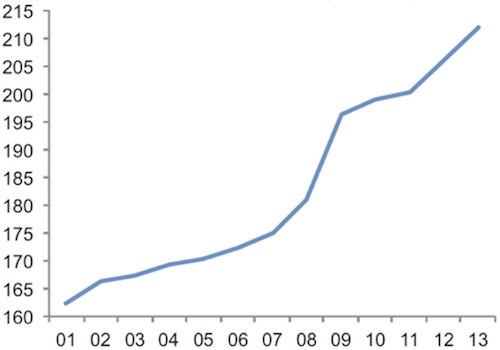 … but their banking systems also rank among the most externally leveraged. In addition to enduring high levels of leverage that remain uncovered by FX reserves, Turkey, South Africa, and Chile are also liable to serious USD shock risk, based on their economic fundamentals (unlike Poland and Hungary, which are less likely candidates for immediate currency collapse given their very low levels of domestic inflation). The lesson here is clear. The catalysts are already in position to spark an initial flight to safety if the USD moves just modestly higher. Some economies (like Turkey, South Africa, and Chile) are more fragile than others (like Russia, Brazil, and India); but an initial wave of crises can push the USD higher and easily lead to larger accidents. The experience of the 1990s shows how, against the backdrop of a relatively strong US economy and policy divergence between major central banks, extreme stress in the emerging markets can lead to elevated US dollar strength, which in turn can trigger additional crises and push the world’s reserve currency to even greater heights. For example, the Mexican “Tequila Crisis” of 1994 played a role in pushing the USD higher and, along with Bank of Japan easing, helped trigger the Asian Financial Crisis in 1997. The Asian crisis, in turn, set off a sharp jump in USD strength and an equally sharp fall in oil demand, which, along with an oversupply of oil, contributed to a crash in oil prices in 1998 and threw Russia into crisis. As the example of Russia shows – and the inverse relationship between the US dollar and oil prices highlights – this is not just a matter of capital inflows turning into outflows, but rather inflows giving way to outflows while the value of commodity exports falls simultaneously. So, this dynamic gets more and more dangerous for increasingly fragile economies as the dollar reaches new heights and commodity markets are stressed. Turkey, South Africa, and Chile may be the likely “first wave,” which policymakers around the world may see as inconsequential… but it’s easy to see how that first wave could grow into a tsunami. It never made the nightly news, the front page of the New York Times, or even the news page on Bloomberg, but Summers’ comment is a tremendous revelation from the man who almost succeeded Ben Bernanke as Fed Chairman earlier this year. By trying to shore up their rich-world economies with unconventional policies like ultra-low nominal interest rates; outright balance-sheet expansion; and aggressive, open-ended forward guidance, major central banks have dramatically widened international real interest-rate differentials and forced savers to seek out higher (and far riskier) returns for more than five years running. But that money did not just move further out on the risk spectrum from low-yielding cash equivalents to higher-yielding assets like US stocks, high-yield bonds, and MLPs. In the process of fighting naturally deflationary impulses and forcing investors to take more risk, the Federal Reserve has also forced an enormous amount of money to move out of the United States and into the emerging world. 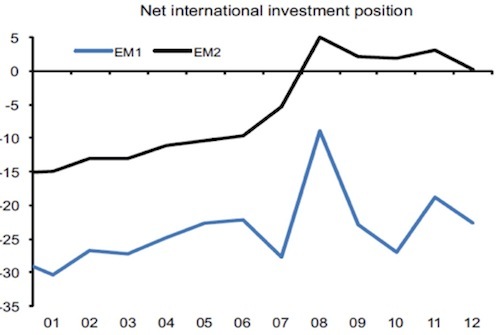 The risks have been clear to policymakers all along, but emerging markets are well outside of the Fed’s mandate. They are collateral damage, so to speak. In his latest issue of Global Macro Investor, Raoul Pal estimates that the resulting carry trade has grown to roughly $3 trillion into major emerging economies (excluding China) and nearly $2 trillion into China alone. My friend Mark Hart comes up with similar numbers for “unexplained inflows” by backing the sum of foreign direct investment and trade out from the total growth in FX reserves, and he discusses the situation at length in a recent “Master Class” interview with Raoul Pal on Real Vision TV. These are staggering numbers, even compared to the massive Japanese yen carry trade that had grown to roughly $1 trillion by 2007; and they add up, quite simply, to the Mother of All Carry Trades… which can unwind VERY QUICKLY in the event of a major US dollar rally. Shades of 2008. That’s the flip side to years of low rates, QE, and aggressive forward guidance. The Fed buys time for the US economy to find its footing at the expense of rampant misallocation across the rest of the world. Major developed economies can adjust their policies to offset the effects, but the emerging markets find themselves in a far more vulnerable position as easy money masks the urgent need for reforms. And once the Fed reverses its policy to reflect relative strength in the US economy, it’s a bloodbath for economies that cannot adjust easily, which in turn pushes the US dollar even higher and starts to take a serious toll on real economies… like China’s, where state-sanctioned data dramatically understates the extent of the world’s most dangerous debt bubble. In the days leading up to All Hallows Eve, the prospect for a US dollar rally should inspire more fear than any campfire ghost story or voodoo curse. This is a realistic and increasingly probable outcome; and the last time the world saw a series of emerging-market crises (first in Mexico in 1994 and then in Southeast Asia in 1997) against the backdrop of a weak Japanese economy and a relatively stronger US economy, it pushed the US dollar to such heights that it triggered a 50% collapse in oil prices, pushed Russia’s economy over the edge in 1998, and blew a hole in the side of a highly levered hedge fund, Long Term Capital Management, that nearly brought down the global financial system. The next round of policy divergence could be far more destructive than that, because this time the global financial system is far more levered; instability is far more widespread; and the amount of money required to backstop an accident will be greater than the Fed’s entire bloated balance sheet. These are the logical consequences of post-2008 financial repression, and they’re the reason why emerging-market central bankers like Raghuram Rajan are calling loudly for better coordination of global monetary policy. It is indeed every central bank and country for itself, and that is a recipe for volatility and financial losses. If you think this story has a happy ending, you are not paying attention to history. I write this at the end of a very packed four days of constant mental stimulation. The Barefoot Summit at Kyle Bass’s ranch in East Texas was up to its usual high standards. And due to the rain we have had all summer, East Texas is about as pretty as I have ever seen it. And the weather was perfect. It was a great setting in which to sit and talk all things macro. Sen. Tom Coburn was in attendance (along with a few other political types), and I find him to be a thoroughly delightful and thoughtful man. I am sad to see his wisdom leave the Senate but understand the personal reasons. We need more men like him in government. And while the weather in Boston was not initially welcoming, it has turned absolutely beautiful today. Niall Ferguson and his team at Greenmantle have put together a most thought-provoking conference. The gathering was held under strict Chatham House rules, so while I can share my thoughts about it, I can’t describe the actual conversations or the people involved without their permission. As you might expect of a man with Niall’s resources and connections, he was able to pull together fascinating panels and presentations of the highest quality. We were treated to in-depth analysis of almost every region of the world as well as to presentations of new ideas and technologies; and the forum was small enough to allow for very active debate. Tomorrow I fly to Washington DC and then on to Geneva for a few days of meetings and some time to gather my thoughts before returning to Atlanta for a day before I finally head back to Dallas in time for Halloween. I’m going to go ahead and hit the send button without my usual final comments, as I want to get to the gym and there is a full evening planned for tonight. You have a great week. Nov. 3, 2014, 2:58 a.m.
havent they already announced the end of QE? So they will not be pushing the button one more time. I am no conspiracy follower but if you have 100 million dollars and the other guy has 1 million dollars you can afford to crash the markets and wipe out the smaller guys. Then go in and buy up big as you have plenty of money left. The USA pumped trillions of dollars into the markets and new that it was not being spent in the good old USA but went into offshore emerging markets. It did little for the USA. Now as they say these EM’s are hooked on the cheap money and as QE is stopping and EM’s will go into shock the money will flow back to the USA and crash the EM’s. This will leave the USA cashed up and RWA to buy back at discount prices the EM’s resources. Nice plan for globalisation. Who ever thought of it is a visionary. Think Sachs, Morgan et al. It is positively a master stroke to consolidate the wealth of the richest families in the World. As they sip their Louis XIII Cognac on the balcony of their penthouse they shout “checkmate China”. Oct. 27, 2014, 11:56 a.m.
Letter looks great just digging in. Oct. 27, 2014, 8:49 a.m. I do not disagree that the outlined events may come to pass, however the article assumes that the Fed will stay fixed in its policy of winding down QE. If the world economy goes into a funk, it will have local effects in the US. It is clear that the Federal powers believe that QE is the tool to help out our economy, so they will be willing to push that button one more time. In my view, it all comes down to timing… When capital flow reversal happens quickly, will the Fed’s countermanding action happen rapidly and forcefully enough to forestall it? My bet is ‘no’. Once a herd changes it’s fundamental direction, it is hard to redirect it back to it’s prior path. But be careful… we live in an investment climate where investors (and those that program the trading computers) are conditioned to be servile to Central Banker Jawboning (CBJ). That conditioning must be broken for the effects outlined in the article to take effect. Oct. 26, 2014, 11:01 p.m.
Sea change? After reading this scary story, sea sick seems more appropriate. I’m sufficiently frightened I think it’s time to turn into a pumpkin. Good night. Maybe I’ll feel (dollar) stronger in the morning. Oct. 26, 2014, 8:24 p.m.
John, I have been reading you for 7 years but never commented. Wonderful insights from you each week and Worth is a valuable addition to your team. Well done and I look forward to your thoughts always. With the rise in dollar you expect, I would appreciate your thoughts on the future of gold equities which I never touched until 1 year ago and fear my timing is not so good. Oct. 26, 2014, 1:48 p.m.
That’s a scary one John. Especially since I am living in one of your 3 high risk EM’s, namely South Africa with its polygamous, ancestor worshipping, kleptomaniac Great Leader. Hopefully my mainly International and commodity portfolio will take the strain, but tax increases have already been mooted to support government profligacy.